Nitish “Ghanchakkar” Babu…Secular people are like empty Coke Cans, you always want to hit them….!!!! so true !! but then Vijay ji they have done their share of homework I am sure and they know NaMo rule is a rare possibility hence technically I suppose its politically correct step 😀 anyways .. these leaders lack identity crises !! No matter what,Modi has an identity , take it or leave it but you cannot expect him to change stances every second moment . Well my Security System tells me that your blog site is “potentially dangerous” (sic) ….pun very much intended….Yet I make it a point to visit it……………..that’s my Indianness to be sure! hehe its a blessing to have you as my visitor . its an honour !! 🙂 I mean it !! It is interesting to see that nothing escapes your keen sense of observation.You have presented it in your own original and inimitable style. 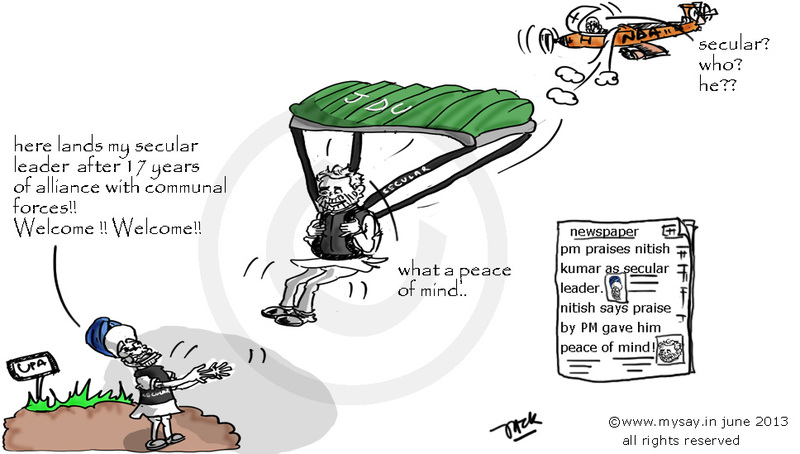 hahahaha… How come suddenly Nitish Kumar became secular? Looks like the definitions are changing every day. 😀 Hahaha ha! I think they are celebrating an early valentine,s day:) Spreading love n all! Great to see u back in form 🙂 Awesome doodle 🙂 u r just so perfect at it! you think I come from Alibaagh 😀 ?? har shaaq pe ullu baithe hain.. anjaam-e-gulistan kya hoga ..
Nice one. It is most unfortunate that Nitish too choose to be an average politician. Uma ..overwhelmed I feel complimented that way 🙂 I am thankful to you for the shower of those motivating words ..
Secularism has become a joke. Some netas think they’re being secular when they’re bashing hindus. Some netas think that by saying the word may times over, they become secular. Liked the comics, even our PM is opening his mouth nowadays. Don’t have much knowledge on this topic, so won’t comment about it. Wonder if either can define secular! waiting for 2014 now… a lot is being anticipated. Tor views through doodles.. shobshomaye bhalo laage. sarcasm & wit-e bhora; excellent. I think this is one of your best. Perfect. Well, artist !! even till now I dont know , if I qualify for that word 🙂 But I am thankful you considered me one,brother !! I love your paintings , whatsoever I have seen so far .. and crave to see more ..
About me ? I think, I am just a little above below average ! Just doodling shapes of various diameter and length .. miles to go..! I used to draw and write about fish and the sea mostly. Thnx about my paintings – have sold a few, its a challenge, but am starting over. Never thought abt it seriously, till ppl asked to buy. Really like your style, with lines and words Mysay. Gr8 going. Me – oh Ive trained to be a writer, but painting happened, funnily, because I started writing in reverse and could not speak, when very young and began to use both my hands :)))))))) I must be confusing you. I am excited !! you could write and paint with both hands ??? Reverse writing ? what would that be ? Mysayyyyyyyyyyy you havent seen reverse writing ? I write totally reverse, like urdu, but english whatever… it looks like lateral inversion. thats mind blowing !! Awesome !! its not like ideal right handers . thats inspiring as well..
U amaze me .. Rayla . 🙂 this rather be named multi-functional I am still hunting down a little more info on the same .Crazy me ! Good ridden to bad rubbish, tough stances are difficult but worth it. Good one! 🙂 It happens during elections! Terrific sketches! 🙂 Our politicians have their uses, provide the daily laugh! Neatly captured in yours! This can happen only in politics. Chalo bole to sahi, so we know he can speak!!! LOL That gave me a good laugh! The cartoon was superb :). Secular my foot! First of all many thanks for the welcome back comment on my blog. And looking forward to a regular dose of your doodles now!